Today I worked on some simple gifts. While normally studio time is spent on designing art quilts to exhibit, it was fun and relaxing to work on a “just for fun” quilting project. 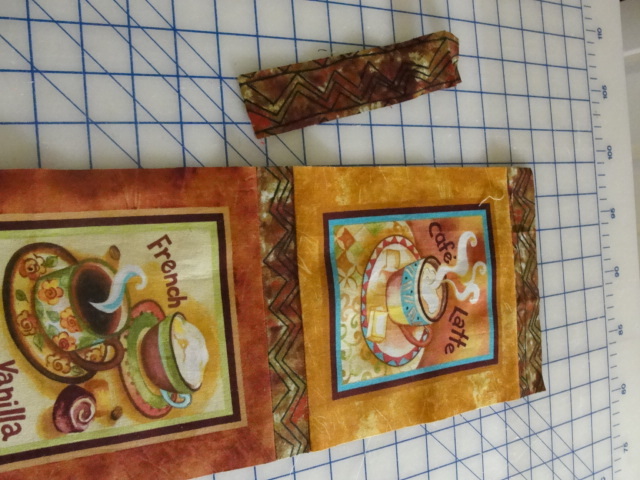 I really liked the colors and coffeeshop motifs of these fabric squares and decided to make two wall-hangings using them. 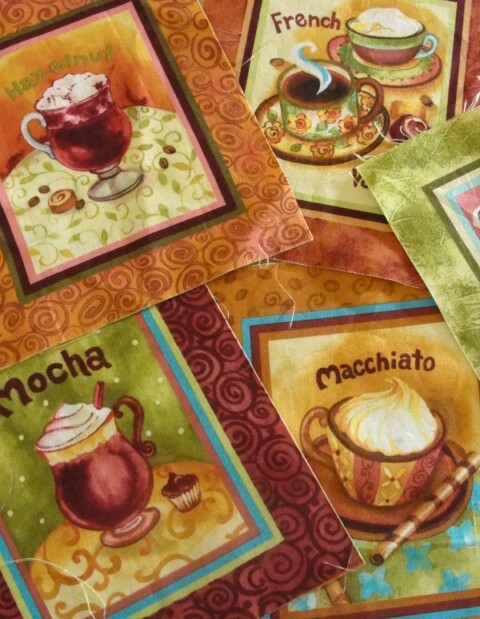 These are gifts for two friends with whom I share conversation, fun times, and “coffee breaks”! 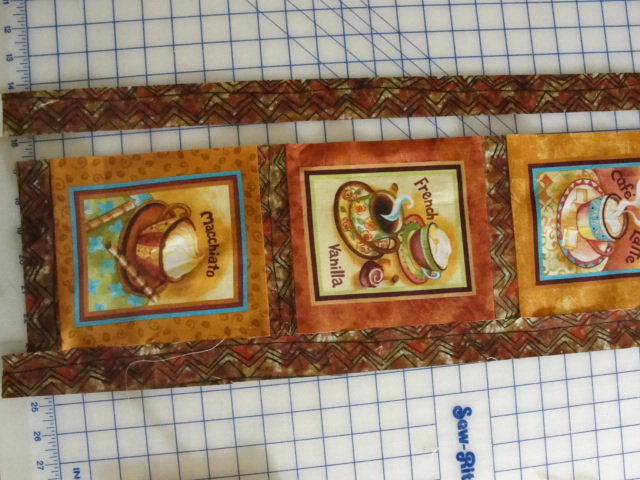 These pre-printed squares were a find during the local spring Quilt Rally…since my background includes all kinds of sewing and textile techniques, I still love to collect and experiment with all types, colors, and prints of fabrics. 3 of these squares were arranged vertically and pieced together with strips. 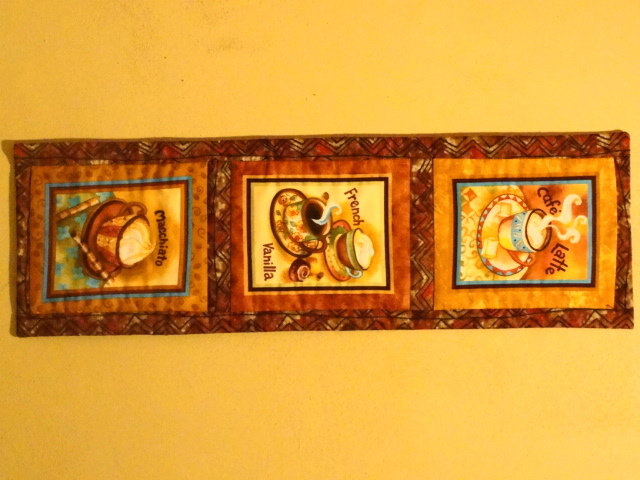 And the top of the first wall-hanging was pieced! And a sleeve for hanging was added to the back. This is the first gift. The second wall-hanging will vary slightly but follow the same method! *I’d love to know what you do in your studio to take breaks and boost your creativity and design process!? nice!!! so now I want a coffee break! Great job. Looks like fun. I have been making salsa’s for fun. Next is spaghetti sauce. I need to finish my T-shirt quilt. Then onto creating a sea baby quilt. Lovely colors! This will surely be appreciated. To “take breaks and boast creativity” in my studio, I play by making dolls and critters, or I nap. I have a great napping chair in my “thinking” corner!